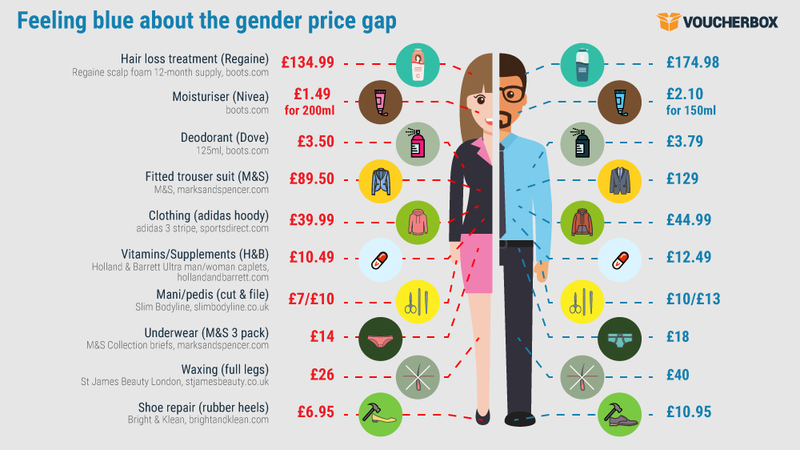 Amidst the war against pink tax, new research from money saving website Voucherbox.co.uk reveals the gender price gap isn’t just hitting women, it preys on men too. Both genders can feel hard-done-by, having to fork out extra cash for almost identical items, with men being hit harder across many sectors, including clothing, vitamins and grooming products – just to name a few. Men about town are paying 58% more than women to put a spring in their step, as a London cobbler can add an extra £4 to the cost of a rubber heel replacement on a man’s shoe. And that’s not the only part of their outfit men are shelling out more for. A similar trouser suit from M&S can cost 44% more for men, while a pack of undies will see an increase of almost a third (29%) compared to the female equivalent. Two thirds of all men will lose their hair eventually*, so it’s no surprise it is a common male concern. What is surprising, however, is the price difference of over-the-counter hair loss treatment between men and women. Examining a 12-month supply of Regaine 5% lotion from Boots, the results show men pay a huge 30% more than women when buying the equivalent product, despite the main active ingredient Minoxidil coming in the same 50mg/g quantity for both products. As the interest in male pruning and grooming rises, it seems the price tags are rising with it. Chaps getting their legs waxed in London may find it costs 54% more than ladies in the same salon. Whilst men wanting a manicure can find a quick cut and file means they are shelling out up to 43% more. While some items reportedly appear in the pink tax list, such as deodorant and moisturiser, Voucherbox reveals it isn’t exclusively so. Popular brands, Dove and Nivea, can be found charging more for branded men’s products. On the Boots website, Dove deodorant is 29 pence more expensive, whilst Nivea moisturiser is 61 pence more expensive despite containing 50ml less. Make great savings at Boots with the latest deals and offers.